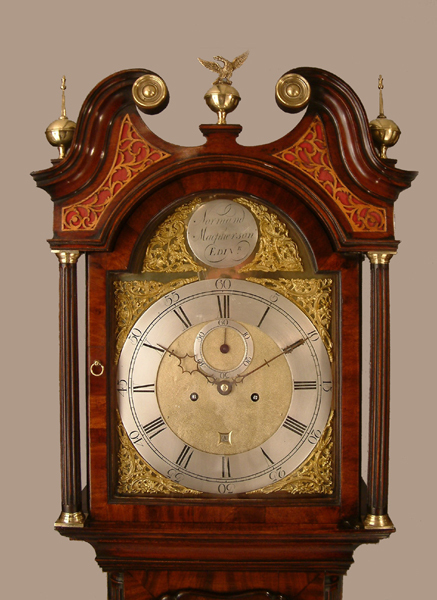 This Longcase Mahogany's Maker - Normand ( also seen spelt Normond ) Mac. Pherson of Edinburgh was of aristocratic ancestry.Longcase by him in the British Linen Bank, Edinburgh, died 1783. Classic "Edinburgh" high quality, figured mahogany, long door case of excellent slender proportions. The swan neck pediment with red "silk" backed frets surmounted by 2 spire/ball and one eagle/ball finial.Side windows to hood and shallow bracket feet. 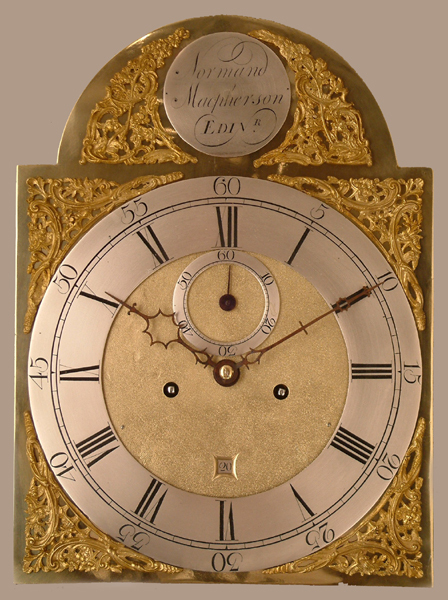 12" breakarch brass dial with separate chapter ring and spandrels, matted centre, subsidiary seconds dial, square date box and name in boss to arch. Good quality 4 pillar movement with hourly ( rack ) striking. Normand ( also seen spelt Normond ) Mac. 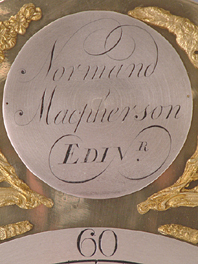 Pherson of Edinburgh was of aristocratic ancestry.Longcase by him in the British Linen Bank, Edinburgh, died 1783. 86" ( 219 cms. ) or 84" ( 213.4 cms. ) ex finials.